Summer is baseball season, and summer in Denver is Colorado Rockies season. Some of the best summer days are the days spent at Coors Field taking in a game. Since Rockies games are one of my favorite ways to spend a summer day, I thought I would share some tips I have picked up along the way. Pre-game festivities are just as fun as the game itself, so plan to get downtown a few hours early to take full advantage. If you are driving, there are paid parking lots all around the stadium. However, Coors Field is just down the street from Union Station, so RTD is an even better alternative to driving, and then you will never have post-game traffic to deal with. Before leaving Union Station, stop at Pig Train Coffee for a quick caffeine fix (they have the best green tea lattes I have ever tasted! ), or if you are more daring, grab a boozy milkshake at Milkbox. There are so many great bars near Coors Field to grab brunch, an appetizer, or drinks before heading into the stadium. Some of my favorites are Hayters, Tavern Downtown, and Viewhouse. At Viewhouse, you can enjoy corn hole, horseshoes, and even volleyball on their awesome patios. As far as cocktails go, be sure to try the Viewhouse mule or the Colorado sunset! Summer weather being unpredictable as it is, I recommend layers that can be taken off and added at will. Summer days can be pretty hot in the stadium, but nights cool down pretty fast, so be prepared for both! You will walk a lot throughout the stadium and downtown, so plan on cute comfort on your feet. 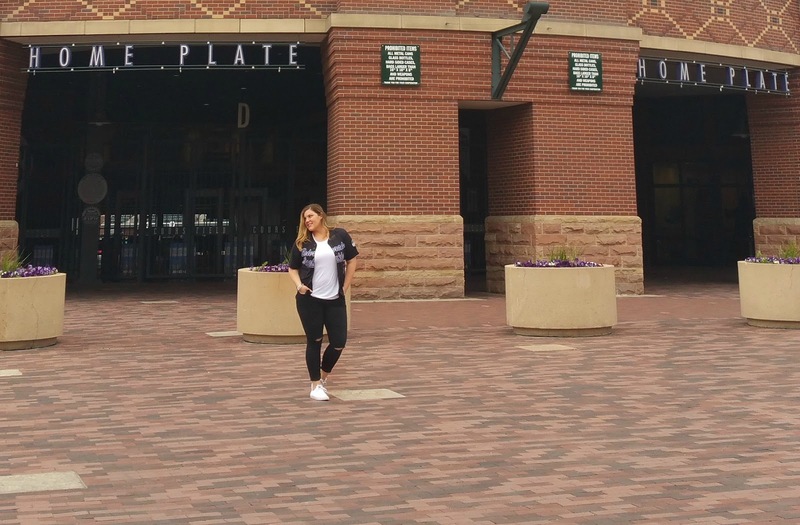 If Rockies gear is your gameday go-to, the best places to find a wide selection is definitely the official Rockies Dugout Stores. They have a huge variety of sizes and styles to choose from, so you’re bound to find something you like, and with locations all over Denver (including the 16th Street Mall), you will definitely find one close to home. One of my favorite looks is a simple jersey, frayed skinnies and sneakers. I actually almost always prefer children's jerseys; I feel like they have more of a jersey-esque (is that a thing?) fit than women's and a much better length than men's. In the sneakosphere, Converse Chuck Taylor All Star IIs are my current favorite, because they have the classic Chuck design with Nike Lunarlon footbeds, which add cushion and coolness after walking on hot concrete all day. If Rockies gear isn’t your thing, take this as your opportunity to bust out your athletileisure finest. High-waisted leggings will keep you comfortable and cute all day long. Fancy Tiger Clothing on South Broadway has a big selection of really cute graphic tees and tanks, as well as a great collection of sunglasses. Dress up the outfit with add-ons like a moto jacket and lace up flats. Don’t forget about your skin either! The sun can get pretty intense on clear days in the stadium, so make sure and slather on the sunscreen. A moisturizer layered under a foundation with SPF will increase your protection. Waterproof eyeliner and mascara will also ensure that you will have no runs or smudges if it gets a little sweaty. While inside the game, don’t stay in your seat the whole time. Walk around, check out the different areas (The Tuaca Terrace on the Rooftop is one of my favorites), and see the game from different angles. Have a beer, yell, jump, and enjoy yourself! Go Rockies!